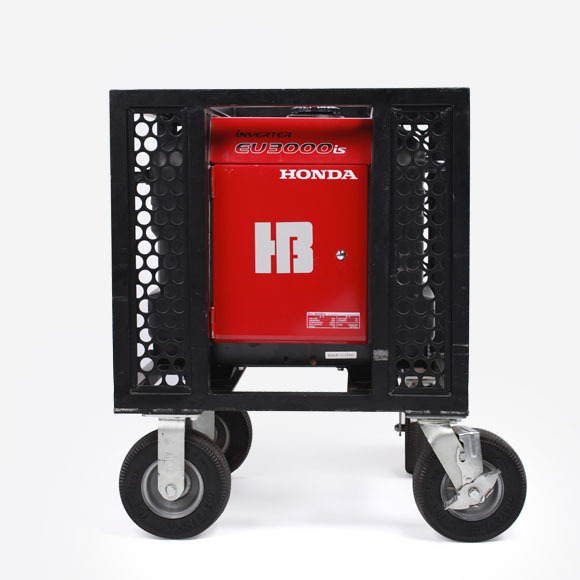 The 3000W gennie, weighing 150 lbs, comes housed in a metal cage equipped with large rubber wheels, making it easy to roll on even rough surfaces, weather that is to set or base camp. The 3000W gennie comes equipeed with 2 120V/20A outlets, and 1 125V/30A outlet and is super quiet. This unit also comes with a fuel saving eco-throttle, which is available via a switch on the control panel. Comes pre-filled with 3.4 gallons of gas which can provide your production up to 20 hours of power. No need to fill it up upon return either, but you might need to rent a gas can (empty) for refilling if you want to keep the power flowing for longer, especially if you have a multiple day shoot. Turn the key past on towards start. You will hear the starter. While you are turning the key towards start, slowly push the throttle back in. The engine should catch and begin running smoothly. Turn the key to the off position. Make sure the fuel valve is left in the open position.